“Acne is considered a disorder with high psychosocial impact and the scarring adds to it. One needs to give hope to the patient that we can address the issue and get back on track”, says Dr. Rajat Kandhari. Fractional lasers have been a revolutionary tool in giving hope to acne patients with scarring. 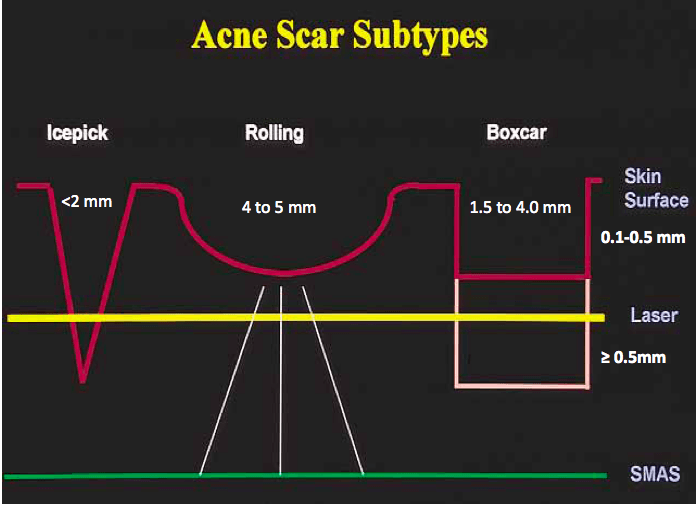 Below illustrated are the different kinds of acne scars, namely ice-pick scars (deep), rolling scars (shallow) and box car scars (shallow or deep). The yellow line in the diagram denotes the maximum depth achieved by most lasers which suggests that the deeper a scar the tougher it might be to treat. Fractional Lasers work on the concept of fractional photothermolysis and target water in the skin. In simplified terms the laser light heats up the skin, breaks the scar and give it time to re-model (or re-contour the scars). The term “fractional” denotes treatment of a fraction of the skin depending upon the skin type and color. The beauty of fractional lasers lies in the fact that I can treat on 25% or 75% of the skin depending upon skin type. These lasers give us the ability to be extremely safe with minimal downtime (you can go back to routine work and activities from the next day, barring a little redness), says Dr. Rajat Kandhari. Typically, 4-6 sessions at intervals of 4-6 weeks. Fractional lasers typically have a down time ranging anywhere from 2-5 days, rarely more than that. The person can go to work from the very next day barring some redness or bronzing. When does one start seeing results? What kind of improvement can I expect? The results are visible most commonly after 2 sessions. The improvement is usually to the tune of 40-60% (or more) depending upon the type / depth of the scar and the skin type. What if my scars are very deep? Any other options? The very deep scars may require combination treatments with the help of fractional microneedling, TCA CROSS technique and/or subcision.